Tomorrow night on SPIKE TV, immediately following Bellator 135, Bill Goldberg hosts Top 10 Knockouts: Glory Kickboxing, an action packed countdown of the ten most exciting knockouts in the GLORY ring, all leading to a preview of GLORY 20 Dubai. 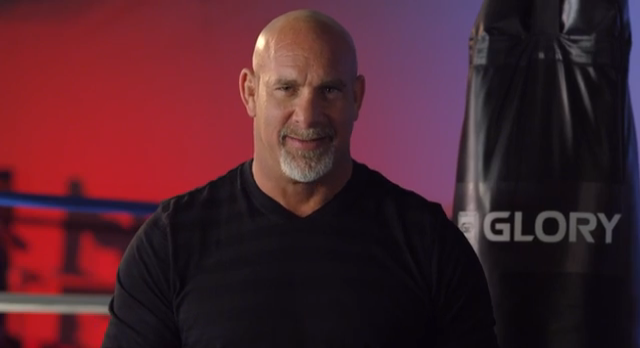 Click here (or the image below) for an exclusive behind-the-scenes clip of the show featuring Bill Goldberg. GLORY 20 Dubai, featuring two world titles fights and GLORY’s one-night, four-man Middleweight Contender Tournament, airs next Friday, April 3 on Spike TV at 10/9c from the Dubai World Trade Centre in Dubai.